A new report released by Human Rights Watch reveals that two persons are being held in incommunicado detention at an undisclosed location in Syria. Karim ‘Arbaji (29) and Tarek Biasi (22) were arrested in June 2007 by Syrian Military Intelligence for expressing online views critical of the Syrian government. A third person, Ali Zein al-‘Abideen Mej'an, arrested for posting online comments attacking Saudi Arabia, was sentenced on September 23 by the Supreme State Security Court to two years in prison. On June 7, the Mantaqa Branch of Military Intelligence detained Karim ‘Arbaji, 29, allegedly for moderating www.akhawia.net, a popular online forum for Syrian youth covering social and political issues. Persons familiar with the case told Human Rights Watch that the Mantaqa Branch may have transferred him to the Palestine Branch in Damascus, but the authorities have provided no official notification of ‘Arbaji's whereabouts. On June 30, 2007, Military Intelligence in the coastal city of Tartous arrested Tarek Biasi, 22, because he “went online and insulted security services,” according to a person familiar with the case. Biasi remains in incommunicado detention, his whereabouts unknown. On September 23, the Supreme State Security Court sentenced Ali Zein al-‘Abideen Mej'an to two years in prison for “undertaking acts or writing or speeches unauthorized by the government … that spoil its ties with a foreign state” because he posted comments online attacking Saudi Arabia. HRW condemned the restrictions on online free speech and called on Syria to release the detainees and to disclose their whereabouts. On October 15, 2006, the Syrian blogger and mother of three kids, Roukana Hamour, who was blogging her experiences with the Syrian legal system, exposing administrative, banking and juristic corruption, was arrested and interrogated by members of the country’s Criminal Security forces. 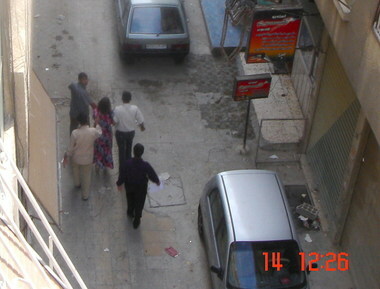 Roukana is continuously being harassed and threatened [Ar] by plain-clothes agents. On April 28, 2007, Syria released the cyber activist Ibrahim Zoro, arrested on April, 5th. Two other activists remain in jail for online activities deemed hostile by Syrian authorities: journalist Muhened Abdulrahman and writer Habib Saleh. Pingback: Decentering Damascus: Syria: Stop Internet Censorship, Release Syrian Detainees Now! Pingback: Global Voices Online » Syria: Stop Internet Censorship! Pingback: Syrian Bloggers-do they put themselves at risk?